Ten years ago, everyone thought we’d be living in a 100% digital world by 2011. In this electronic utopia, file folders and their contents would be nothing more than a distant memory. However, for most businesses there’s still plenty of paperwork that needs to be managed and stored in a paper based filing system. That’s actually OK – as long as you have a clearly labeled, well organized filing system. The fact is, that paper files don’t have to be messy and inefficient. Here’s an overview of several side tab or end tab file folder options that have stood the test of time for protecting documents and making them available for easy reference. These are likely to be the most popular file folders in your office. 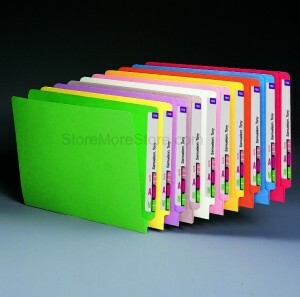 Everyone loves color coding – and fortunately there are over a dozen file folder colors to choose from. When you combine the use of side tab labels with color coding, it cuts down on misplaced files and the time required to locate a particular file substantially. Give a few boxes of colored folders and file labels to the most detail oriented person in your office and they will have a field day organizing and categorizing your entire filing system. Just make sure they create a filing system organization chart so everyone can learn the rules of the new color-coded system quickly. The bendable metal prongs on the inside of file folders keep papers securely in place and in sequence are called file fasteners. 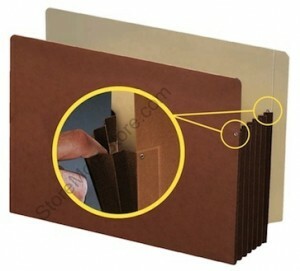 These fastener file folders are popular in departments where documents need to be kept well order and secure. Keeping documents organized and secure within a file folder enhances productivity and file integrity. For example, important active documents might be securely positioned on top for quick reference. Securing documents with file fasteners makes it easy to audit each folder using a simple document forms checklist. You can just flip through the paper records quickly rather than having to pick each page up from one pile and set it down on another. The two-hole punch fastener configuration also makes documents less prone to tearing than they would be in a 3 ring binder. It’s not just fast food meals that get super-sized. Sometimes you need folders that will accommodate thick files. Accordion type expansion file pocket folders with paper gussets will work for a while, but expansion gussets made of Tyvek is really what you want for long term durability. 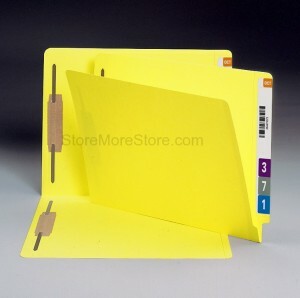 These file pocket gussets are made of high density polyethylene fibers that are bonded together with heat and pressure. It’s virtually impossible to tear the resulting synthetic textile with your bare hands (go ahead and try). Look for a high “point” or material thickness weight designation on these products as well. That’s an indication that the file pockets are made out of quality material that’s thicker than a traditional file pocket folders and designed for heavy usage. These are just a few options when considering side tab filing solutions, but whether you need end tab folders, classification folder, labels, hanging file pocket folders, redrope wallets, pendaflex or x-ray folders, we’ve got them all at the best prices! 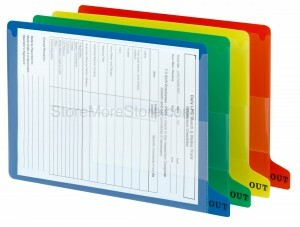 Take a look around at StoreMoreStore and be sure to view our FILE FOLDER SPECIALS!